Dr. Camacho speaking to the Society of Women Engineers at Boeing. Mixonian Institute training is not for all companies. Mixonian Institute, founded in 2009, serves companies that value innovation and learning. Our typical clients are scientists, chemists, analysts, programmers, biologists, and other highly-trained professionals. 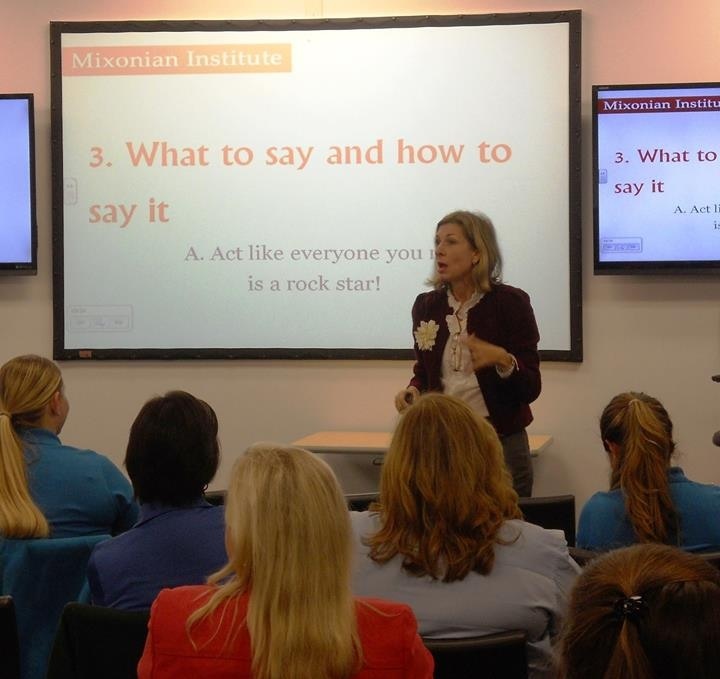 Mixonian Institute teaches those skills that raise performance, productivity and engagement. Dr. Camacho speaking at DisruptHR Greenville. Research shows that the best learning happens in chunks, not three-day seminars. Our programs are delivered in 90-minute modules. Participants come out energized, engaged and have an incredible new perspective on their work. Through our training programs, professionals gain a clarity that reduces confusion at work, which turns out to be an instant productivity booster. More focus on more clear priorities means better performance. Better communication increases engagement and profits. In teaching growth mindset, emotional intelligence and communication principles, your whole company benefits from the ripple effect. They, in turn, teach their team to be more emotionally mature, to be more proactive and focused. This change results in lower levels of discontent, resentment and frustration. In the big picture, with enough participation, your whole company culture becomes more appreciative and participative. Your employer brand is stronger and your company attracts a higher-level workforce and enjoys more retention. This isn’t your mom or dad’s leadership model and it’s not even a purely U.S. workforce. Immigrants make up 16.4% of the workforce and that percentage is growing. The Mixonian leadership model is informed by diverse thinking, communication and leadership research and decades of experience in the global marketplace. It takes a commitment to excellence to be world class in your market. Mixonian develops your talent to take your company to the championship level. Develop your talent and your company culture transforms. And when you get down to it, it’s the culture that makes a global brand. If you’d like to know more and see if your company is a good fit for our programs, please email laura@mixonian.com. See Video of Dr. Camacho speaking at Disrupt Charleston (May 2017)! Laura Mixon Camacho, MBA, PhD, PMP founded Mixonian Institute in 2009 to offer the world fresh solutions to communication conundrums. She has a special focus on helping professionals who want to be recognized thought leaders. She is an executive coach, corporate trainer and international speaker. And card-carrying introvert. Laura is obsessed with helping creatives and technical professionals have more successful conversations. All conversations should be carried out with style and enthusiasm (that's personal branding for you). And a presentation is just a special conversation. Dr. Camacho energizes her audiences with my innovative (read “quirky”) approach to effective conversations. Using examples from popular culture and her own international experience, she shares what it really takes to get your message across to the right people. Living in Caracas, Venezuela, and becoming completely fluent in Spanish. The first time I moved to Caracas, the Internet had not been invented. Price controls made ordinary products like flour and chicken disappear from the market for weeks at a time. I stretched so much it was incredibly painful but also rewarding. I have completed this event 5 times and this year I’m hiring a coach to improve my time. Starting a company at the age you’re supposed to be paying for your kids’ college. That was on the heels of an unwanted divorce, in the middle of my PhD program having just returned to the United States. It was the scariest project ever. I learned to just keep moving forward, even if at a snail’s pace. I am on a mission to rid America (then the planet...) of boring presentations. Want the skinny on making a presentation that people really tune into? Get the FREE "No More Boring" 28 page illustrated PDF below!